Getting my hair colored is kind of therapeutic for me. Ever since I had my last hair color on June of this year (2012), I’ve been dying to get my hair colored again; that’s why when it comes to stuff about my hair, I’ve been really careful so that I won’t damage my hair because of too much coloring. One of the hair coloring stuff, which I pretty much trust my hair with are the Bubble Hair Coloring. They don’t contain ammonia and according to an Etude House Sales Attendant, I can use their Bubble Hair Coloring even after only a month after coloring. 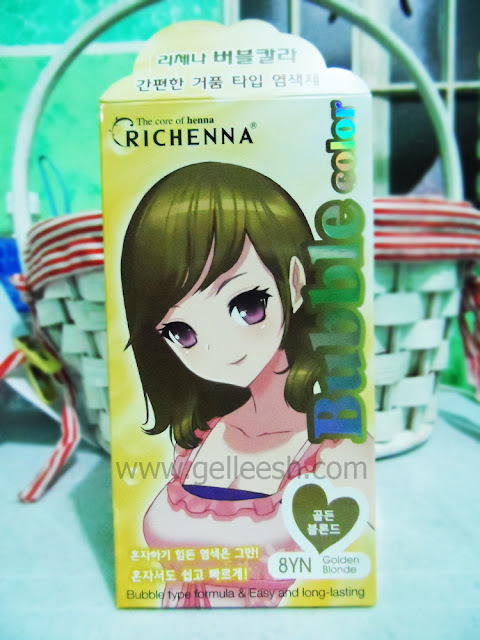 I have decided to have my hair colored blonde and I was, initially, planning on buying the blonde shade from Etude House Bubble Hair Coloring Treatment; however, when I passed by Watsons, I saw another bubble hair color branded, Richenna. I actually came to believe that if it’s Watsons, it’s pretty safe to use so without any hesitations, I grabbed this coloring treatment and used it the exact day I’ve purchased it with. 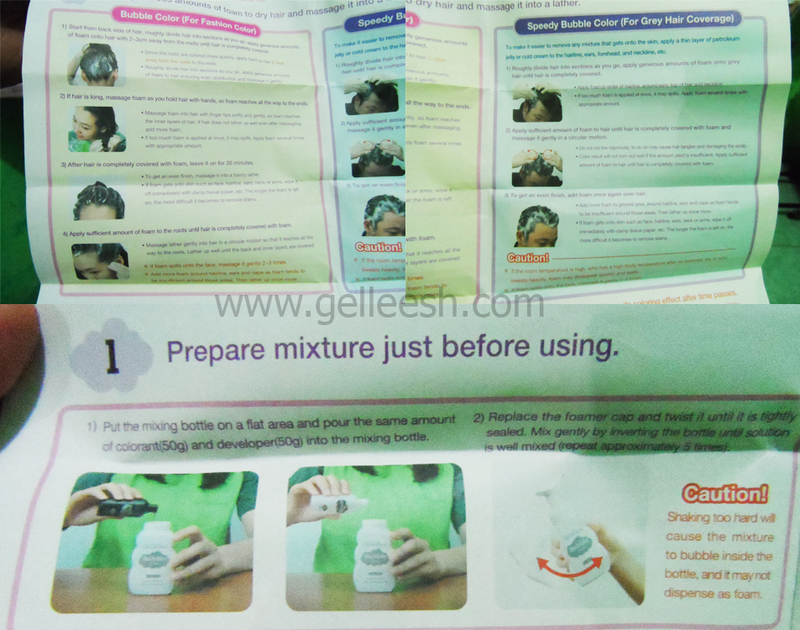 Directions on how to use it are actually same as how you use your other Bubble Hair Coloring treatments. Click THIS for directions on how to use a Bubble Hair Color. So, the shade I got was in Golden Blonde and I’m quite expecting a lighter blonde hair color from my violet-turned-red-after-keratin hair color. Would it be possible? First of all, the Richenna Bubble Color in Golden Blonde is pretty inexpensive as it only costs PhP300.00 The packaging is okay and is just like any other bubble hair color. The equipments are complete too. From the usual developer and color with the mixing bottle and conditioner treatment, you can never say that the content was not worth it. Oh, and this bubble hair color has got English instructions, which can be found inside. The after-scent leaves a salon-y smell, whic is expected when you color your hair. And the conditioner treatment, which comes with it doesn’t really soften your hair afterwards unlike the conditioner treatment that comes with the Etude House Bubble Hair Color. The color doesn’t look bad on my hair though it didn’t give the kind of blonde I’m expecting. When I checked the back of the box, I saw that it won’t turn even a lighter blonde hair to a more lighter color but it will turn a hair into a darker shade of blonde and since I’ve got red hair now with black roots, it just made my hair redder and not really blonde. So I’m all to blame on the result. Would I recommend this hair color? I will say it is okay but go and buy the Etude House Bubble Hair Color. 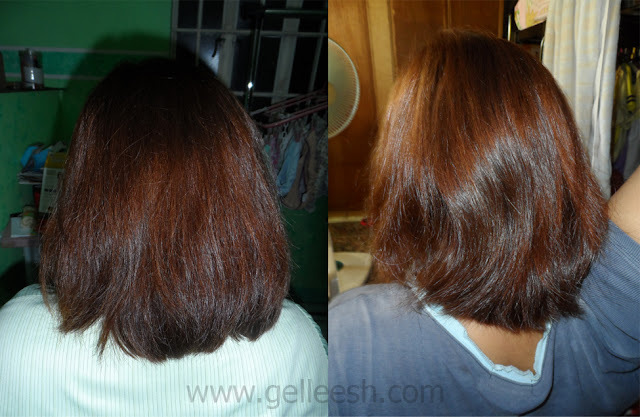 Application is just as easy but the Richenna’s conditioner treatment was such a big disappointment for me. 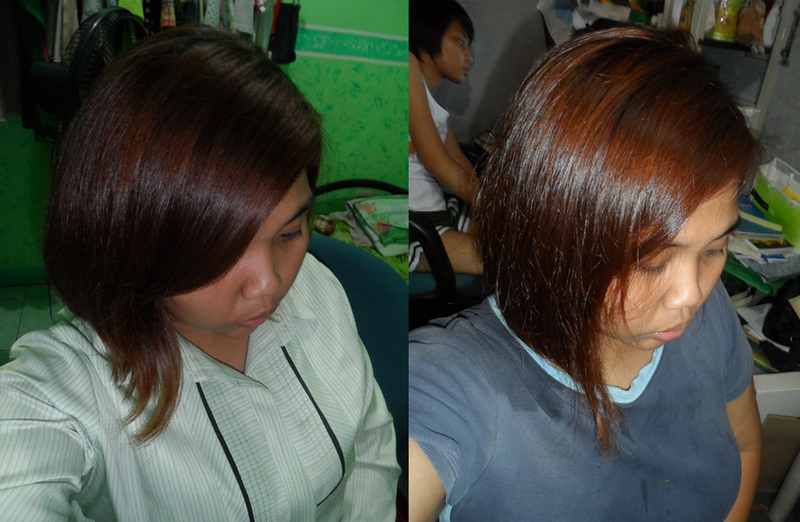 Good thing I have HBC Hair Treatments and I used one of ‘em as an after-treatment for my hair. I’m giving this hair coloring product a rating of 7/10. It’s a bit cheaper than the Etude House Bubble Hair Color, but the difference is in the conditioner treatment and I think it matters. Although I have no major complaints on the result because it’s actually my fault for not paying much attention on the color result chart at the back of the box. i knew i'd see this color kit on your blog sis. :) I didn't get this one too when I saw the swatches on the box. all of them are still dark. and I'm aiming for a lighter one on my next coloring. :) Thanks for the review sis. pretty! i don't think it did anything for the blonde-ness but i do think it made your hair shiny!! it seemed to have added some high and low lights to your hair :)! Hi! I love your blog! I have been following you for awhile now but never commented. Anywho, I notimated you for a blogger award! You can see it on my blog by clicking here. Have a good one! Oh, I was expecting like totally blonde. So it's golden pala talaga! Wow, maganda sya kasi shiny. Thanka Mica. But there is a big possibility that I won't be purchasing this again because it made my hair coarse. Hi! I've also tried bubble hair colors. First one is from Etude House, then the Prettia. Although the color is noticeable, i wasn't able to achieve the color I want, even though I was just expecting less than what was displayed, coz I know my hair is dark to start with. I did a research and found out bubble hair colors are less of a damage but doesn't really give you the shade/color as it should be, compared to creams. So that's why after 2-3 months from my last hair color, I opted to go to a salon and had it done there, and I really love the result. I'm halfway to achieving the same hair color as Camille Co's. I guess there's really not much of a choice but to spend on hair care products and treatments.